Whether for trimming small branches or for some light trail clearing, either on a bike, horse, or while backpacking, a folding pruning saw is a companion. 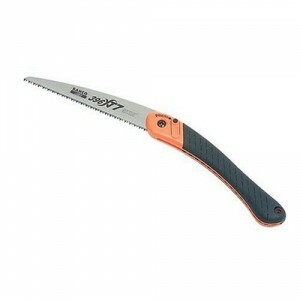 Lightweight and easy to use, folding pruning saw makes pruning a breeze. A folding design also makes it easy to take along with you when you’re pruning and gives you space-saving storage when you’re done. Lightweight, easy to use and sharp, the Corona RS 7265 Razor Tooth Folding Pruning Saw will make cutting and pruning a breeze. 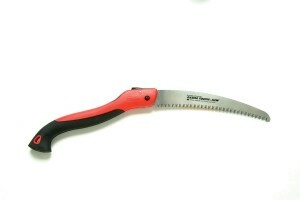 This Razor Tooth Pruning Saw blasts through small and medium branches with ease. Each whetstone-ground razor tooth is sharpened with 3 angles for a blade, allowing for faster, cleaner, smoother, easier cutting. Great for green or hard, dead, and frozen limbs. Looking for a reliable tool for trimming small branches? 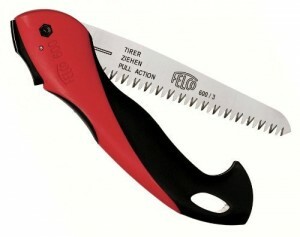 You will love the Felco F-600 Classic Folding Saw with Pull-Stroke Action. This compact and lightweight folding saw features rust resistant, hard chromed blade made of high quality steel. The shape of the blade is thinner at the top and thicker at the bottom. The new ergonomic handle is made of non-slip comfort material for comfortable use. Great for cutting branches up to 4-inches in diameter. If you need to take down tree limbs that are too thick for a lopper, then the Fiskars 7 Inch PowerTooth Folding Pruning Saw is for you. Perfect for making quick, clean cuts through branches, this folding pruning saw features POWER TOOTH blade with razor-sharp, triple-ground teeth to make aggressive cuts. And the fully hardened steel blade will stay sharp longer than others. Non-slip grip offers control. Featuring 3-sided razor teeth on a replaceable, curved, taper-ground 14″ blade for the best cutting, the Corona RS 7041 Razor Tooth Folding Pruning Saw makes sawing large branches a breeze. The impulse-hardened teeth stay sharp longer and ensure a long service life. It also features cushioned handle for firm, comfortable grip, offering more cutting power. Easy to latch blade lock for safety. Looking something for general and end-of-season pruning? 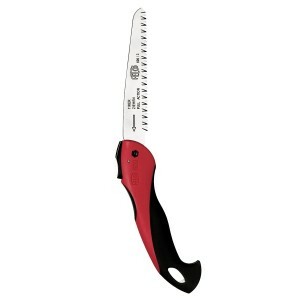 Try the Bahco 7-1/2-Inch Folding Pruning Saw. The Bahco folding pruning saw features a patented unset tooth configuration designed specifically for making fine cuts on soft or green wood. And its aggressive hardened teeth is powerful enough to cut quickly through hard or dry wood. For added safety, the saw locks in both the open and folded closed position. Also features soft-grip plastic handle for user comfort.